Waxahachie City Hall is located at 401 S. Rogers Street, Waxahachie, TX 75165; phone: 972-937-7330. Photo: William Lewis House, ca. 1888, 1201 E Marvin Avenue, Waxahachie, TX 75165. Listed on the National Register of Historic Places in 1986. Photographed by User:Renelibrary (own work), 2012, [cc-by-3.0 (creativecommons.org/licenses/by/3.0)], via Wikimedia Commons, accessed November, 2012. Founded about 1850, the name is a Native American Indian word meaning "buffalo creek." 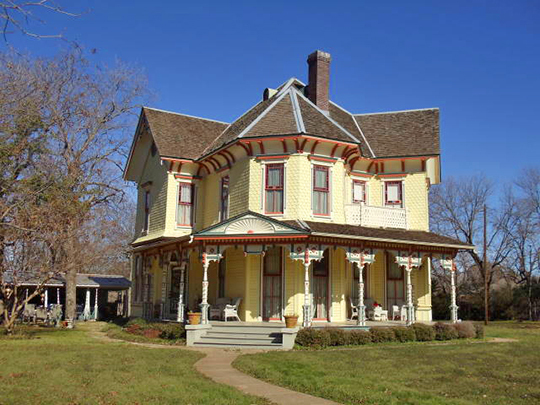 Covering a valley, Waxahachie has many residences of modern architecture, in brick and stone. The town is densely wooded, with sycamores predominating. It is one of the largest primary cotton markets in Texas, in the heart of an agricultural region noted for its heavy production of this crop. A textile mill utilizes the lower grades of locally produced cotton in the manufacture of duck and other heavy materials. The town's industries also include two large cottonseed oil mills and a cotton compress. During the Civil War a powder mill was operated by the Confederate government in Waxahachie, but a terrific explosion ended the enterprise early in 1863.